We understand how the aesthetics of an environment can directly affect the guest experience, that’s why we’re trained and highly skilled to work with a variety of site settings, materials and designs to deliver flawless craftsmanship. are challenged with an array of elegant curves and shapes, our artisanship creates timeless style and luxurious surroundings that even the worldliest of travelers will find flawless. While we acknowledge the necessity for durability, detail and creative problem solving, our unique approach to the tile installation allows us to continuously perform on-time and on budget. 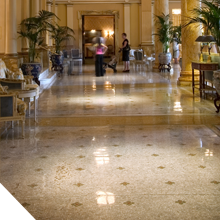 Renowned as one of the most meticulous and detail oriented tile. For a full list of hospitality clients visit our projects section. Wm. Erath & Son, Inc.